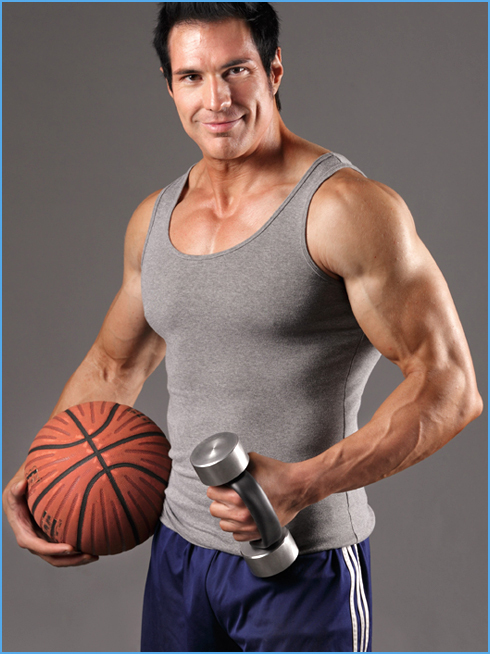 “Properly done, Heavyhands exercise can be safer than other forms of aerobic type exercise. We do recommend, however, that you consult your doctor before undertaking any exercise program that requires a significant increase in physical activity. You may be able to benefit from Heavyhands exercise if you have a physical handicap, reduced hand grip, suffer from a prolonged illness, or have had problems such as hypertension or other cardio-circulatory or orthopedic problems. It is particularly important that in any of these case, you work closely with your doctor to determine the exercise program that is best for you. 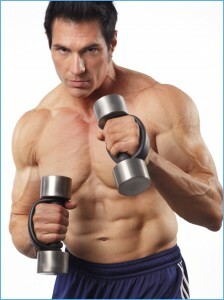 Heavyhands exercise is aerobic in principle, and can includes more variations of movement than other forms of exercise. No major muscle group is neglected, and muscles already well trained by sports and exercise can be even further upgraded by Heavyhands training. The concept was developed by Dr. Leonard Schwartz, and coined “panaerobic exercise.” His book, Heavyhands, The Ultimate Exercise, describes movements that involve virtually every muscle in the body at the same time. 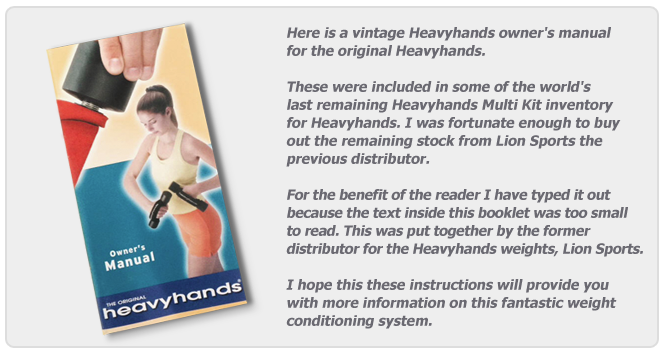 We recommend the book for complete information about the theory and practice of Heavyhands exercise. Heavyhands aerobic weights are different than conventional dumbbells, because they are moved or pumped through a high number of repetitions. Essentially, the key lies in combined arm, leg, and trunk movement. The weights put special emphasis on the often neglected muscles of the upper torso, and work those versatile muscles in combination with leg exercise. Heavyhands exercise is an incredible tool for developing endurance conditioning, including your heart, which is essential to endurance training. Like other aerobic activities, Heavyhands training pushes for duration and intensity, working towards the largest rate of oxygen consumption over the longest reasonable period of time. Oxygen consumption is directly correlated with calories burned. Thus, the more oxygen consumed during exercise means more calories and fat are being used up. Welcome to Heavyhands exercise, the unique exercise method that brings the benefits of strength, endurance and flexibility to your entire muscular system, while training your heart. A later text consists of a broad approach to heavyhands walking. Other materials in the form of texts and videos will cover other forms of Heavyhands exercise in some detail. Properly done, Heavyhands exercise is probably safer than other forms of exercise at given work intensities. Nonetheless, it makes sense to consult a physician who is more than casually interested in exercise before beginning any exercise that increases cardiorespiratory and/or mechanical action signification. Beginners afflicted with certain medical conditions may also benefit from Heavyhands type exercise. In those instances working with an exercise specialist is highly advisable. 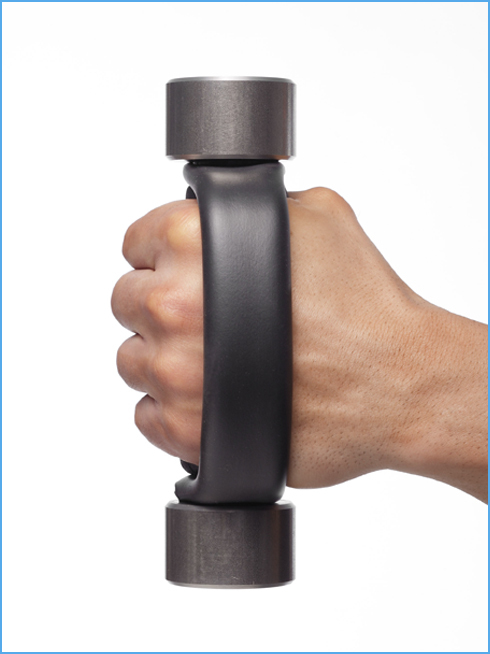 Heavyhands is hand weight-assisted whole body exercise. 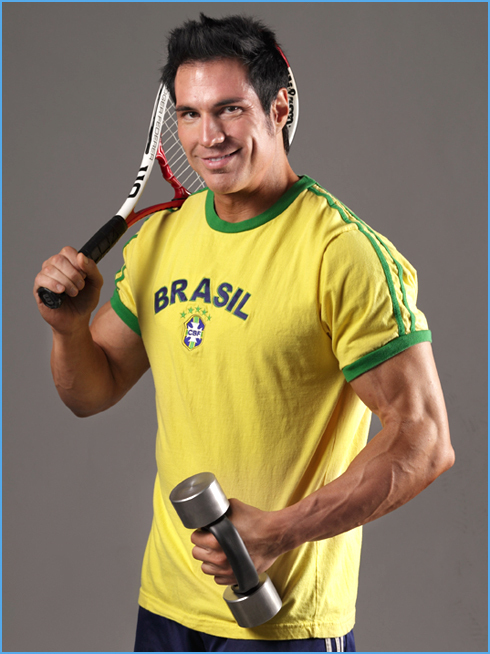 The goal is to include a high percentage of the body’s total muscle, simultaneously. A second Heavyhands principle relates to bringing the qualities of exercise, things like strength, cardiovascular and muscular endurance and flexibility to all those muscles! Since the number and variety of Heavyhands movements is practically endless, it is likely that your Heavyhands workouts will increase your motor skills and sheer physical power over time and these improvements in turn will help make your exercise ‘feel’ easier. The Heavyhands method itself suggested the structure of its special hardware. We needed hand weights that would continue to be comfortable during prolonged, high repetition movements. The soft material that covers the shaft and strap portions of the weights lends them a glove-like quality that lessens the need to grip them tightly. This feature diminishes fatigue and may lessen blood pressure elevations in some who are susceptible to that problem. 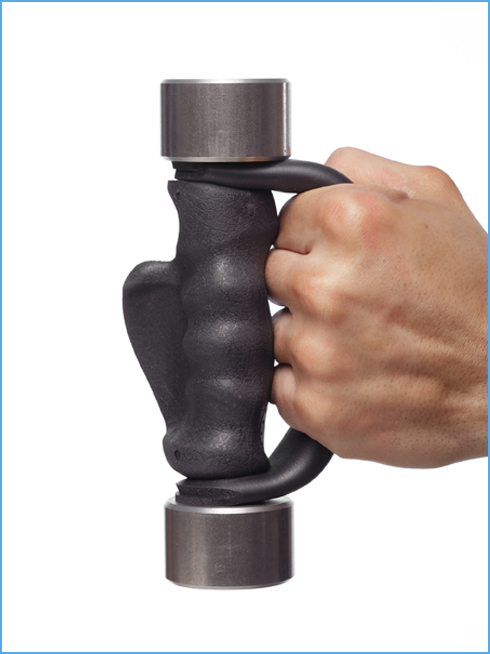 Heavyhands handles are cushioned for comfort and specially designed to fill the specific requirements of Heavyhands training. The innovative ergonomic design and flex fit back strap feature spares the muscles of the hand, wrist, and forearm from overstrain and cramping, delays fatigue, and promotes better and a more skilled performance. The back strap design is self-adjusting, allowing the handle to fit hands of different sizes and shapes. Although the straps are very strong and durable, care should be taken not to overstretch the strap. The Heavyhands add-on weights are balanced for consistent performance, are attractive, and will last a lifetime with proper care. IMPORTANT! The weights are made of steel, and if left outside, in the rain, mist, or fog, they will rust. After use, wipe dry and store inside away from moisture. You can protect them from rusting by spray painting them with a rust preventative paint. Rustoleum brand spray paint will stop rust. We sugest you use the flat black color. I both looks good and hides dirt and dings. The ergonomic grip may be easily cleaned with warm water and a mild soap. Avoid abrasive cleaners, bleaching agents, or the use of stiff brushes. 1. The straps should be positioned behind the knuckles so that the rounded fitted ergonomic grip fits comfortably in the palm of your hand. The strap may also be positioned across the fingers between the knuckles and first finger joints if that is more comfortable. Avoid gripping too tightly. This will help to consciously relax your grip during exercise. Gripping tightly during prolonged exercise can cause cramping, and early fatigue. Do not hold your weights by the back strap. This can damage your weights system. 2. Start with smaller weights and work gradually upward to the heavier ones. Heavyhands weights are easily interchangeable to fit your increased strength and growing capability. It is advisable to have a variety of weighted ends on hand. 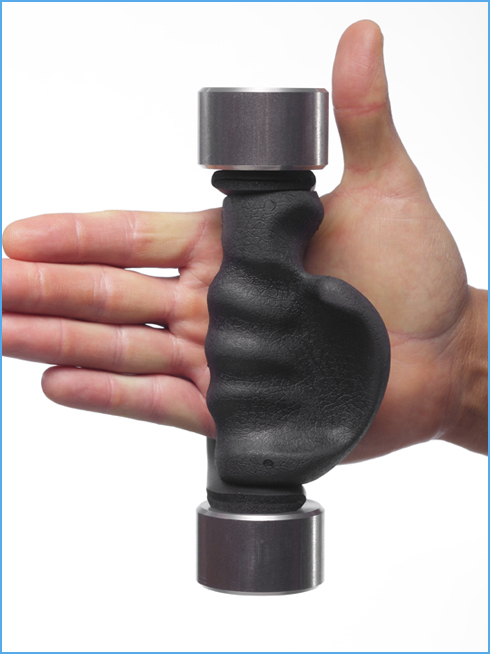 Twist-on weights are available from 2 – 20 lbs. 3. Be sure the black flanged washers are in place and the weights you select are securely tightened to the handles. 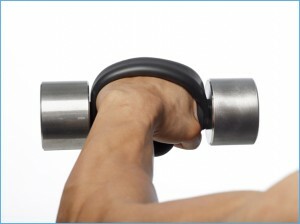 The best procedure is to hold the hand weight horizontally and grasp the weighted ends. Twisting each end in opposite directions will tighten both simultaneously. Simply reverse the procedure to loosen the weights. Avoid holding the weights by the straps to tighten or loosen. 4. As with all physical activities, warming up is not only advisable, but essential. Always start slowly, working into your desired pace. Give yourself plenty of room, especially when exercising with a group. In time, moving your Heavyhands weights will become very natural. Be careful not to hit yourself on down-stroke movements where the weights pass close to your body. What size hand do I have? It’s a PDF file. Download here. 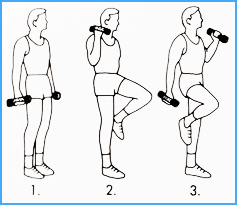 Here are some basic movements that may be included in your exercise program. Once you have mastered these starters in combined exercise, you may spice up your routines with countless variations. The higher your move the weight, the greater the intensity of work being done at a given pace. Like all exercise that engages muscle, including running, Heavyhands becomes a heart conditioner. Your pulse rate is your best way for you to monitor your body’s response to exercise. Pulse monitoring techniques are described in many exercise books, including Heavyhands. The exercises included will be useful both to beginners and aerobic enthusiasts. For an in-depth discussion of the theory and practice of Heavyhands exercise, refer to Dr. Schwartz’s book, Heavyhands. A basic exercise that converts the modest effects of a stroll into a respectable conditioner by involving your four limbs. Position 1. Grasp the weights in the thumbs-up, palms in position. Arms at full extension by your sides. Heavyhands exercise, by their nature, reduce the need to travel, i.e., the need for users to have ample space to move while engaging in physical activity. Heavyhands workouts of any intensity can be done while remaining primarily in one place while practicing knee dips, lunges, kicks and a host of other leg movements. By enabling users to create a whole-body exercise experience within confined spaces, Heavyhands is one of the most practical and space-saving options on the market. 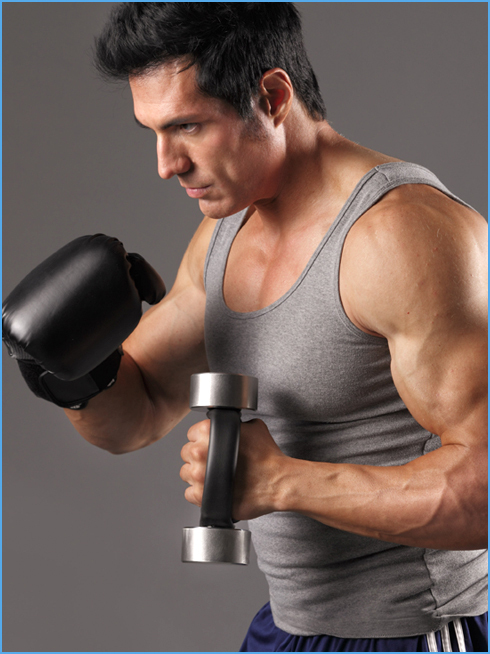 Heavyhands exercise will surely benefit all who haven’t special reason for not doing it! Age appears not to be a disadvantage so long as entry into the method is gradual and proceeds under the guidance of expert advice. Simple arm and upper body additions to walking strides are quite enough to get you launched on the road to whole body fitness, lifelong. 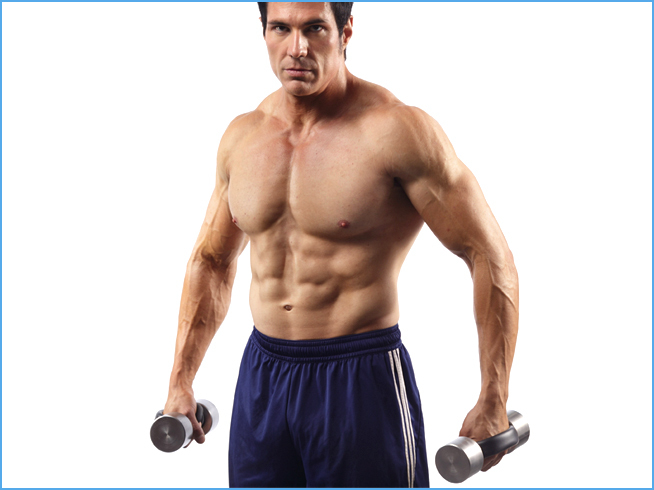 We recommend the Heavyhands systems for those who would like to add muscle strength and cardiorespiratory endurance along with some new lean body mass, while losing substantial sub-skin fat. Both genders are well suited to practice the method. The techniques are particularly useful for those who don’t always have time for long workouts. Research has shown that 5-10 minute exercise sessions throughout the day can bring benefits that can be at least as great as the traditional 30 to 60 minutes of uninterrupted exercise. Certainly, individuals who are already well engaged in other favorite exercise methods will find that adding Heavyhands for the specific benefits it promotes makes good sense. The documented benefits of exercise continues to lengthen. The addition of Heavyhands to other basic physical activity allows users to benefit even more from the exercises they already engage in. * And a general sense of well being. Here’s a partial summary of the advantages of the Heavyhands Product/System mix. The Heavyhands product was conceived after the technique had been ‘discovered.’ It became clear that a glove-like hand weight construction was necessary to best secure the desired fitness benefits. Since strength and flexibility were part of such benefits, along with cardiorespiratory effects, interchangeable end weights were necessary to provide these options. The Heavyhands text and the concept were published before this hardware technology had been developed. Heavyhands Aerobic Hand Weight handles were designed for comfort, hard wear, balance and attractiveness. Used properly, they will bring you many years of faithful performance. Remember that the strap portion of the Heavyhands handle should ride over the back of the hand, behind the knuckles. Heavyhands offers a variety of end weight options in order to most effectively complete the different exercises. For example, if you wish to use pump n’ walk as a primary exercise, high pumps may require smaller end weights than you could manage at lower pump heights. Many handlers use a number of different end weights according to the workout they select. We recommend the heavy/light option to which heavier end weights are used with exercises that demand less range of motion and relatively slow tempos, as opposed to light ‘n’ lively stride/stroke combinations with relatively high tempos. In the beginning, one pair of handles and a set or two of end weights will suffice nicely. You may soon wish to extend your Heavyhands equipment with some additional end weights and handles. Research has taught us much since the early days of Heavyhands exercise. Both our muscles and our cardio respiratory systems respond favorably to a wide selection of movements. It is important to note that a highly respectable form of whole body strength can be developed with the Heavyhands hand weights of any size. When the weights are relatively small, strength may be pursued in the form of faster tempo exercises and hand speeds, as well as with increased ranges of repetitive movements (a in high pump walks, or in shadowboxing). The goal in all Heavyhands techniques should be to gradually and comfortably increase the dimensions of the exercise load within the bounds of safety whenever possible! When choosing your end weights, take into consideration the types of movements your chosen activity will demand. Be sure to choose weights that will promote cardio and strength endurance, while also being appropriate to your body’s capabilities. Any type of exercise can injure. Overdoing any exercise can lead to injury and minimize returns on your health, performance, and appearance. Make good choices when deciding on the end weights and movements that will work for you. Heavyhands can be done just about anywhere. Heavyhands movements were designed to allow users to exercise in a wide range of environments. While many prefer the outdoors for their workouts, larger and larger numbers will find that exercise in front of their TV screen along with entertaining or instructive programming can be a winning combination. It is an effective response to the frequent lament that exercise is boring and a sheer waste of time! Because of the design of the movements themselves, a small, fixed floor space offers the exerciser all the options they need to build the sort of fitness that they desire. Therefore, almost any room in most homes will be fine. Heavyhands hand weights are the most effective and comfortable means of adding the entire upper torso to leg and trunk exercises. They finish the job of converting to whole body strength and aerobics. There isn’t a single reason for not engaging the great volume of muscle that lies north of our waistlines! Studies have shown that by taking this whole-body approach, we can bring more intensity to our workouts. Incidentally, we can lose more calories while training by way of more ‘mastered’ movements, either indoors or outdoors. Our weights are relatively inexpensive, durable, balanced, and comfortable, The design of the weights also allow for longer intervals of exercise without fatigue. 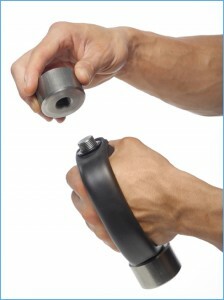 And with interchangeable end weights, users have endless exercise options. This is hardly the place for an in-depth presentation of literally hundreds of Heavyhands movements. Three texts have been devoted to that topic. * Ambulatory Exercise, which includes various forms of Heavyhands walking and jogging. Ambulatory exercise will continue to be a mainstay for ‘handlers’ around the world. The simple addition of the alternate arm ‘pumps’ simultaneously with strides of the opposite leg is all there is to it. Pump n’ Walk can be as simple or complicated as you like: strides and ‘strokes’ can be varied endlessly. Just be careful to not overdo it! The calorie expenditure of the Pump n’ Walk movement has been measured extensively and has been found to be the exercise of choice for many. Note! Heavyhands walking is really an entire system of whole body exercise. Plain Pump n’ Walk is only the beginning. To see all the variations of this one exercise, refer to The Heavyhands Walking Book by Leonard Schwartz, M.D. (Panaerobic Press 1991). Remember: the height and frequency of your pumps will determine to a great extent the energy you expend during Pump n’ Walk. 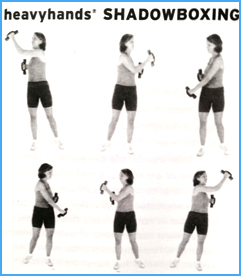 Shadowboxing with Heavyhands is for many handlers an all-purpose exercise regimen As long as you keep your arms and legs moving rhythmically at a comfortable intensity, you are sure to benefit and even enjoy doing this activity. Footwork can be airborne or shuffling, arm strokes of any tempo or range of motion you select. The Heavyhands shadow boxer needn’t worry about his less than professional look. As in other forms of Heavyhands, it’s the effect that counts. For example, you may find that you wish to do your shadowboxing using a more symmetrical stance even though it doesn’t resemble conventional boxing much. Or, your footwork might be more complex than what most boxers would likely use. It’s all up to you. Double Ski Poling is a favorite of many handlers, as it engages a very effective combination of large muscle groups: The great quads of the thigh fronts; The huge lats that widen the upper back; The trapezoidal muscles that shrug the shoulders; And many other low back muscles, as well as the difficult abdominals. 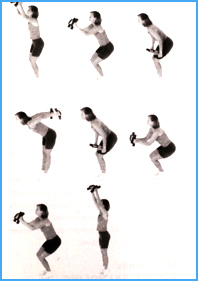 Again, this move can be quite difficult, and is recommended for more advanced fitness seekers. It should be embarked upon, as with other Heavyhands movements, with lighter than necessary weights until the movements and proper form become second nature. Starting above the head, the weights are swung in a downward direction, then through and up in back, while the back itself flexes forward. The weights are finally returned to the upright position (see Heavyhands: The Ultimate Exercise System, by Len Schwartz, M.D. page 134 for more details and pictures). Heavyhands Dance lends the Heavyhands discipline the unique opportunity to add upper body movements and energy to the fun of dance! You needn’t be an expert to do this activity. And keep in mind, even though dancing is supposed to be fun, it’s also a wonderful way to get a total-body workout. Simply follow the music using a sampling of the Heavyhands moves you’ve been practicing. Walking Heavyhands style is an excellent way to start. After a while, you may create more complicated choreographies that will soon become part of your dance repertoire. Enjoy! A mainstay of most veteran handles, Swing and Sway presents an opportunity to engage some of those large muscles that are often excluded from conventional exercise. The prominent side leans to one side, and twisting movements complement the considerable arm and leg work that makes S&S an effective calorie burner. And it all can happen in front of your TV! Swing and Sway – also called Figure 8s – work well when combined with walking with long strides. Try them with both your heavy and light Heavyhands, and with a variety of tempos and ranges of motion. Finally, S&S is dance-like enough to partner with your favorite music. Heavyhands proves invaluable in the preparation for most sports, whether we’re talking about strength, muscle and cardio endurance, or flexibility. 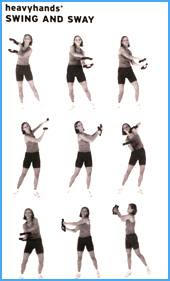 Golfers, for example, can use a range of Heavyhands whole body movements to lengthen their drives and iron work. Working with Heavyhands can also improve the multiple joint flexibility that is incorporated into every great swing. 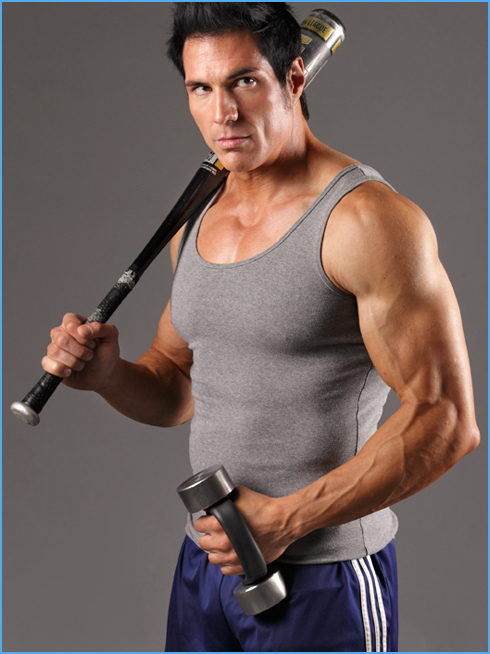 For a sport such as baseball, the necessary fitness factors needed for sprinting and swinging the bat can be cultivated through a number of Heavyhands exercises. As in other sports, a series of characteristic movements are basically condensed into prolonged power laden strength and endurance routines. The Duck Walk and pump is basically an alternate stride/stroke pattern. 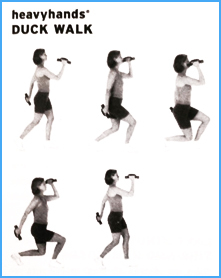 With the Duck Walk, the left side strides and knee dips while the right arm pumps to various heights. Rarely do we find those who can fuse the waddle and pump ‘n’ walk – those who can do high pumps while the flexed knees leave the thighs absolutely horizontal. I like to reserve these two moves for advanced handlers and the stronger athletic types. 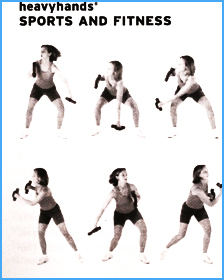 Most of our Special Effects moves are related to a series of combinations that include the abdominals and low back. Last Minute Tips and Reminders! There are dozens of core movements we might have chosen to detail here. These few were suggested for their likely appeal to large numbers of Heavyhands beginners. * Make sure end weights are good and tight before launching into “Heavyhands exercise!” It takes only a second or two, and might prevent a very sore toe! * Don’t give up on those moves you don’t like much at first blush. Some are destined to become your favorites. * Try the “heavy-light” system: but don’t’ choose your ‘heavies’ among weights you can’t move repeatedly for at least 3 comfortable minutes. * If you have other exercise preferences, gradually add a few of the Heavyhands moves until you establish a combination that feels good to you. * Learn to take a radial (wrist) pulse and use it to estimate your work level. It’s probably the best single indicator of where you are on in terms of intensity. * Stay away from movements that hurt. There are too many Heavyhands combinations to risk getting hung up on painful routines. * Exploit the Heavyhands system to prepare you for your preferred sports activity: Scooping grounders or hitting forehand and backhand tennis shots can be choreographed readily. * Almost any sport contains certain “characteristic” moves yearning to be included into exercise/health. * Expect 24 to 48 hour post-exercise soreness after a tussle with some hard new movements. * Don’t ignore the importance of a good diet! Food ultimately fuels your exercise ambition. * There are two major concerns with diet: how much to eat, and what to eat given the particulars of your body, personality, lifestyle and exercise game plan. * Learn to love exercise! A love of exercise is a reward for years of diligent, sensible practice. There is always something new to learn! Apply your fitness gains to bunch of tasks in your life and don’t be afraid to invent! What are you waiting for? Tex or call 858-692-9461 to get started. Not seeing a &amp;amp;amp;amp;amp;amp;lt;a href=”http://www.scrolltotop.com/”&amp;amp;amp;amp;amp;amp;gt;Scroll to Top Button&amp;amp;amp;amp;amp;amp;lt;/a&amp;amp;amp;amp;amp;amp;gt;? Go to our FAQ page for more info.